This blind and its accessories are dedicated to my dear friend, Ed (angus 1949). My heart, thoughts, and prayers are with you...you are missed around here more than you know. Blind made in SKS 5 (XP) and SKS 7 (Windows 7). Optimized for WB 7. Most of the Vista elements have been skinned, but I am not sure if they will work...will need to choose the Windows 7 version of the blind if you have Vista. All elements of XP have been skinned. Everything that could be skinned for Windows 7 is skinned....IE 8 and the Drop Down Favorites Menu are un-skinnable at the present time. Fancy font included. My thanks to Fairyy~ for testing the XP version! 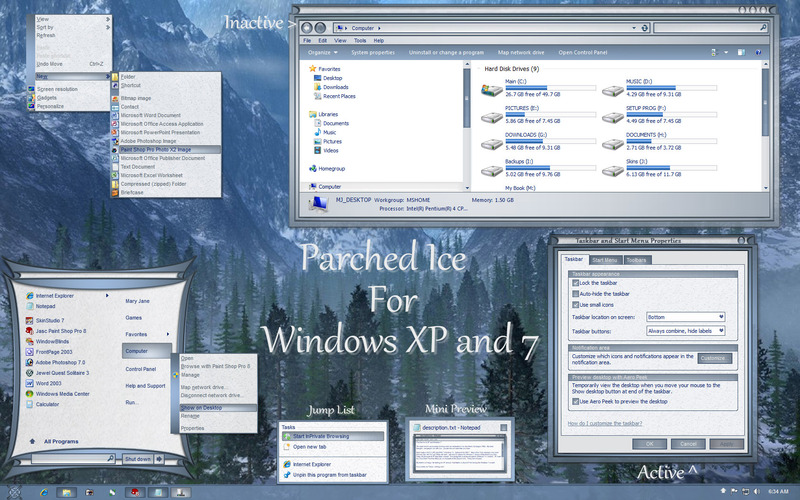 And thanks to Kyros511 for testing the Windows 7 version! Excellent++++. Love the start menu. Thanks, jazzymjr...I know Ed will feel so complimented! Thanks Rick, sargan and Xiandi. � � I'm glad to hear that the blind works ok in Vista...not having Vista anymore, I was reluctant to make a separate substyle for Vista, since I have no way of testing the blind while making it. OOPS! Doc, you snuck in one me. Thanks! I didn't tell Ed I was doing this...so, I hope he doesn't get upset with me! Beautiful work as always. Well done. GORGEOUS, Jazzymjr! You always do such awesome work! Color is beautiful. Please keep them coming! !